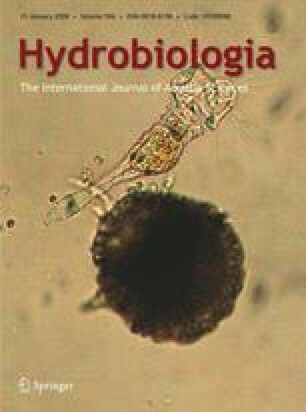 Nitrogen (N2) fixation has been identified as possibly an important source of “new” nitrogen (N) to the epilimnion of Lake Malawi but studies in 1999–2000 and 2002 (September–December) estimated that the contribution of N2-fixation by heterocystous Anabaena filaments to the N budget of the lake’s epilimnion is only 3–4% of total N input. N2-fixation rates in Lake Malawi, as estimated by the acetylene reduction assay were higher during the stratified season (September–March) than during the rest of the year. Planktonic N2-fixation in Lake Malawi can be monitored by measuring heterocyst biovolume concentrations because a significant correlation (r 2 = 0.945, P < 0.0001) was observed between the two parameters. Heterocyst density cannot be used to estimate N2-fixation because heterocyst sizes in the lake change continuously as at least two Anabaena species with different heterocyst dimensions are present. During September–October 2002, a species similar to A. maxima, contained larger heterocysts (16.34 ± 2.46 and 13.25 ± 1.89 μm in cross and apical section dimensions, respectively). In November–December of 2002, A. discoidea dominated and had smaller sized heterocysts (8.92 ± 1.13 and 7.25 ± 0.95 μm in cross and apical section dimensions). Since planktonic N2-fixation is higher near shore than offshore, its contribution to the N budget in the littoral zone where high densities of grazing benthic fish occur may be more critical to maintaining the high rates of benthic algal productivity observed. This project was funded by the SADC/GEF Lake Malawi Biodiversity Conservation Project and by the Natural Sciences and Engineering Research Council of Canada (NSERC) through an individual research grant to Dr. Stephanie J. Guildford. The authors would like to sincerely thank Dr. Harvey Bootsma for his many contributions and support of this project when he was at the SADC/GEF Project and even after he moved to the University of Wisconsin, Milwaukee. We also thank Dr. Ralph E. Smith and Dr. Kistern Müller of the University of Waterloo also for their many contributions to the success of this project. We also thank the Director of the Department of Fisheries in Malawi for allowing us to use their facilities and equipment at Salima in 2002.